Being one of the smallest breeds of dogs, a shy or timid chihuahua is a regular problem. There are many reasons why this may happen which actually has little to do with their size, and more to do with their environment. 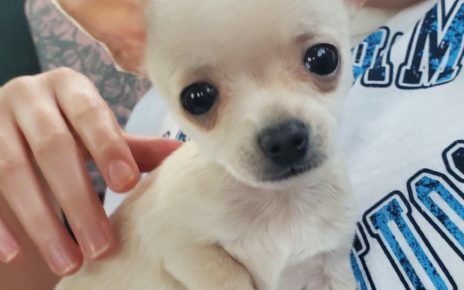 Let’s take a look at reasons why your chihuahua is shy or timid, and then we can figure out about how to make your little chi more confident. Rescue chihuahuas are often times very timid dogs. 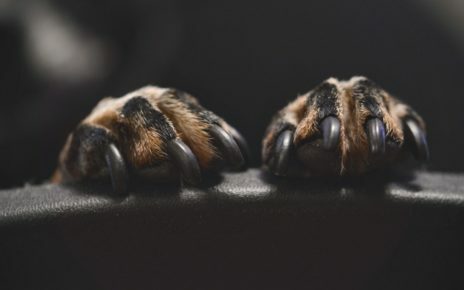 It’s sad to say that many dog owners may be abusive of their pets and it results in traumatic experiences that may be impossible to ever fully recover from. Loud and wild environments may also bring your shy or timid chihuahua to be. Remember that this dog breed isn’t a very large breed, and even though they may act tough, they know their size. Loud yelling or noises from kids banging on things may keep scaring the chihuahua until it’s always scared of everything. 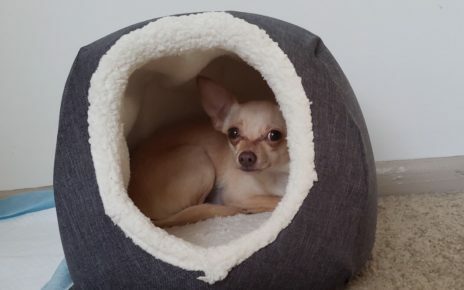 Your little chi may also just be shy around other people or around other dogs, this may be mostly a fear of other dogs or people but also could mean your chihuahua is just simply antisocial. Being isolated during the first few months of its life could be a reason for this. It’s easy for humans to come to terms with being shy and know how to deal with it or how to help others with the affliction. Yet for chihuahuas being shy or timid, it should be handled a bit differently. Don’t force visitors to come interact with your chihuahua. Your chihuahua is timid and scares easily, forcing it to socialize with people won’t do any good in helping the situation. Don’t force your chi out of his or her hiding spot. Your dog doesn’t want to come out of the spot it hides in, and forcing it to will just result in making it more scared. Just be sure to bring it food if it stays there too long. Try to bring the overall noise levels down to a more mellow level. This may be difficult with children around the house, but try to get the children in on keeping the noise levels down to help your scared little chi feel more safe. Don’t bring your chihuahua around large aggressive dogs. Subjecting your tiny timid chihuahua around large scary dogs could be even more traumatizing should something go wrong. Things like being shy or fearful and timid are not quick or easy to help fix. This is going to take a lot of effort on your part and a lot of time as well. There’s a few tricks that may help to build your chihuahuas trust and confidence. Standing could be interpreted as a threatening pose to your chihuahua. If you’re towering above your chihuahua it may feel overwhelmed by your size or stance. I’ve on many occasions with timid dogs got down onto my belly and spoke calmly with my hand out calling it’s name and succeeded in getting it to come up to me. Small victories like this is a great beginning to helping to build your dogs trust levels. 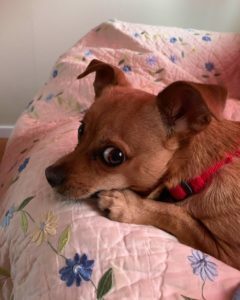 Quick hand movements may be perceived as threatening to your chiwawa dog, especially if it has a past history of abuse. And loud strong voices may only scare it more. Remember to move nice and slow and speak calmly when trying to communicate with your dog. Chihuahuas can be bribed with yummy dog snacks or food. If it seems to not trust you very much at all, it is very possible to win its heart and trust with food. Make sure to move slowly and calmly and try to sneak in some petting while it eats. This one goes alongside with towering over your chihuahua, eye contact could be thought of as a form of standing off and aggressive. 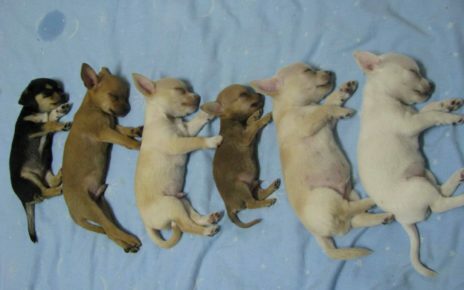 While laying on your belly, try to keep your head and eyes lower than your chihuahuas. This will show a submissive pose and make your dog feel less threatened. Some trainers use a crate for training or such things as potty training or even a place for them to sleep. Personally I’m against caging any animal and I believe allowing free roam at all times will help grow a dog’s confidence. Slowly introduce a new face that is very good with animals. By slowly introducing someone new that is amazing with animals and understands them, they can help to expand your chihuahuas socialization. The introductions should be kept to a minimum with dog treats and very slowly in a nice quiet environment. Let them win them over with food while in submissive only poses, and in no time at all your chihuahua will trust another person. If you’re able to get your chihuahua out and willing to be trained, great! Each time there’s a successful attempt remember to reward it with treats and petting and happy voices. The more positive interacting your chihuahua gets, the more confident it will feel. Introducing animals to each other is always nerve racking. The best method would be a safe, quite, controlled environment. I would recommend just allowing them a separated visual of each other to start. Try to put each of the animals in areas the other has been so they are able to get a scent of one another. If neither are showing too much signs of fear or aggression, the next meeting allow them to go a little bit closer. Try to use your best judgement to keep your chihuahua safe, such as asking the other dog owner or handler to use a harness so as to pull the other dog away quickly if they turn aggressive. Some chihuahuas respond well to clothing that is embracing them. It may make them feel more safe while also keeping them warm. As chihuahuas are prone to become cold this is also just an extra accessory that can help in more ways than one. All these tips are just good practices to help make your chihuahua less shy or timid, but the most important thing is to love your little furry friend with all your heart. If you have any more tips or tricks, please feel free to comment down below and let us know.